Bonnie Doon's Scottish Shortbread is a family owned and operated establishment located in beautiful Manchester, Vermont. 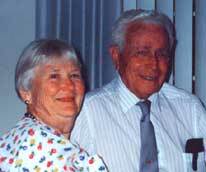 Wayne and Dot Munsey (photo right) founded the company and proceeded to bake the finest quality shortbread available in their home-based bakery. Today, we occupy a new commercial bakery located adjacent to our home. Bonnie Doon & Courtney Munsey We named our company after three generations of "Bonnie Doon's" starting with Great Grandmother Bonnie Doon Thompson, Grandmother Bonny Doon Bradstreet, and finally our mom Bonnie Doon Bradstreet Munsey. The Bonnie Doon's family produces these delectable Scottish baked goods for special events, (Craft Shows and Scottish Festivals), and mail orders only. We utilize choice all-natural ingredients. Our belief is shortbread is not shortbread unless made with lots of pure natural butter. Absolutely no preservatives are used in any of our products. In addition, the techniques we use to make our shortbread create a very light "melt in your mouth" experience compared to the more traditional dense texture. The primary line of products includes twelve delicious flavors of shortbread hand cut into approximately one-inch squares. The squares are first packaged in sealed poly bags, then in eight-ounce bakery bags. This provides an incredible shelf life of six months, if kept away from direct light or sunshine, or, up to one year in the freezer. The specialty line includes, Traditional Shortbread Cakes imprinted with the Scottish Thistle, Scottish Cinnamon Swirls, Millionaire Shortbread (caramel, macadamia nuts & chocolate on traditional shortbread), Chocolate Covered Shortbread, & Scottish Fruit Filled and Chocolate Filled Delights (thumbprint cookies). These are also made the traditional Scottish way using all natural ingredients and lots of real butter. Our tasty Oatcakes, described as "Scottish Granola Bar" is a very popular item. The combination of ingredients used gives them a more delicate texture and buttery nutty taste. Topped with Marmalade or Honey, they make an excellent breakfast item or snack with afternoon tea. We have available, year-round, attractively packaged items for special occasions and gift giving. The gift boxes and decorator tins are custom made with the flavors of your choice. 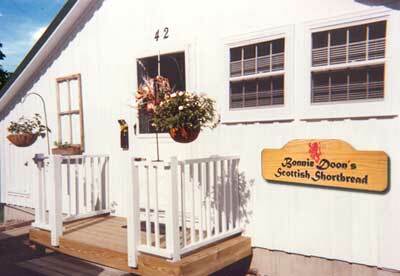 Bonnie Doon's Scottish Shortbread products are available at Scottish Highland Games and Craft Shows. Geographically we cover these events on the East Coast and west to Michigan. Some of the Craft Shows we participate in are: Sugarloaf Craft Festivals, Artisan Promotions Festivals, Arts & Craft Festivals, Craft Producers, Rose Squared Productions, and Top Notch to name a few. In addition, the Scottish Highland Festivals locations are: Scottish & Irish Music Fest in PA, Bonnie Brae Scottish Games in NJ, Long Island Scottish Games in NY, New Hampshire Highland Games at Loon Mt., Celtic Fest in PA, Richmond VA Highland Games, Goshen CT Highland Games, and Liverpool NY Highland Games, to name a few. Our involvement in Craft Fairs and Scottish Festivals is constantly changing, so please feel free to contact us for more information on these events. 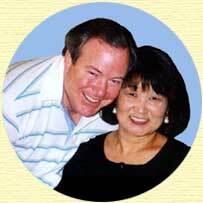 Wayne Munsey lost the battle against cancer on June 17, 2000.
home-based operation by his family. We dedicate this website to him.